There are many different themes that can be considered when organising your wedding and these can have an impact on the type of wedding car you choose. Aside from the colour scheme where will your wedding and / or reception be? It could be inside or outside, in a city, a lovely village setting, a rural barn, a field, a setting with beautiful garden or botanical backdrops and of course it could well be in a different country from the one that you live in which would of course open your eyes to different types and styles of available wedding cars. As the writer of this blog let me share my own wedding experience, not necessarily everyone’s idea of how to do it but for us it was fun and at the same time intimate although low key, our wedding transport included an aeroplane, a golf buggy and a stretch Limousine! 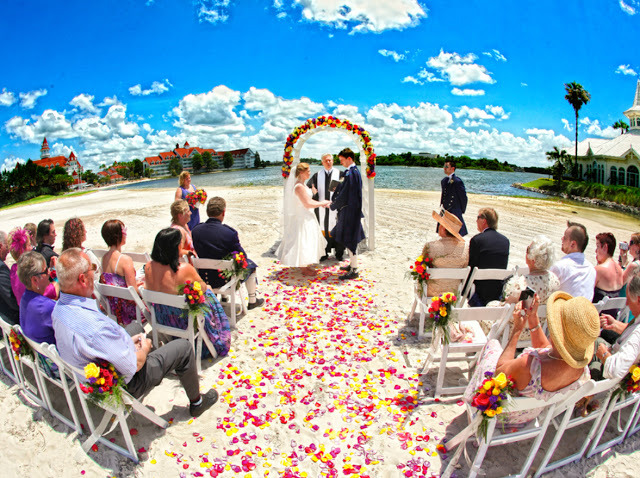 As we already had 2 young children of our own we decided to we really wanted them to be part of it and we decided to tie the knot as part of a holiday to Disney-world, Florida! The wedding package that was incorporated into our holiday was superb, Bride to be was provided with a hairdresser on the morning of the wedding, a chauffeur driven stretch Limousine took us to our wedding venue, the beautiful Luau Beach at the Polynesian Resort overlooking Disney’s Magic Kingdom on arrival at the resort we were collected in the golf buggy and driven (very careful) to the beach. A photographer was included as was the vicar, cake, Champagne toast and a lovely man serenading us with his guitar. The garden look – it looks expensive but doesn’t have to be and the beauty of it is that this theme can work indoors as well as outside and therefore can be incorporated all year round. It’s a classic, trendy look increasing in popularity and will never go out of style. 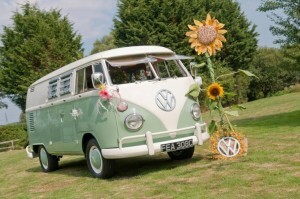 The colours within a garden theme are amazing and very diverse and therefore your choices of wedding transport are very open. 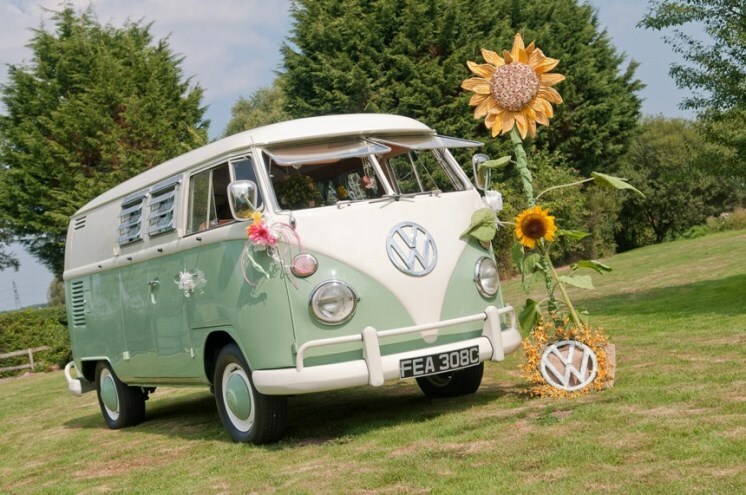 Vintage cars work particularly well with a garden themed wedding as do Campervans, they just seem to fit really well and often can reflect on the personalities of the brides and groom. 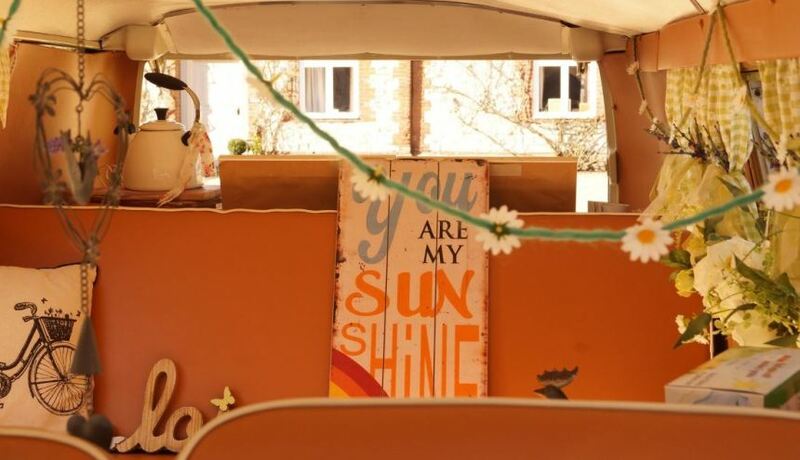 You will find that when talking with the private owners of Campervans that they have or can source props for the vehicle to compliment your theme. A barn wedding can be a charming affair. 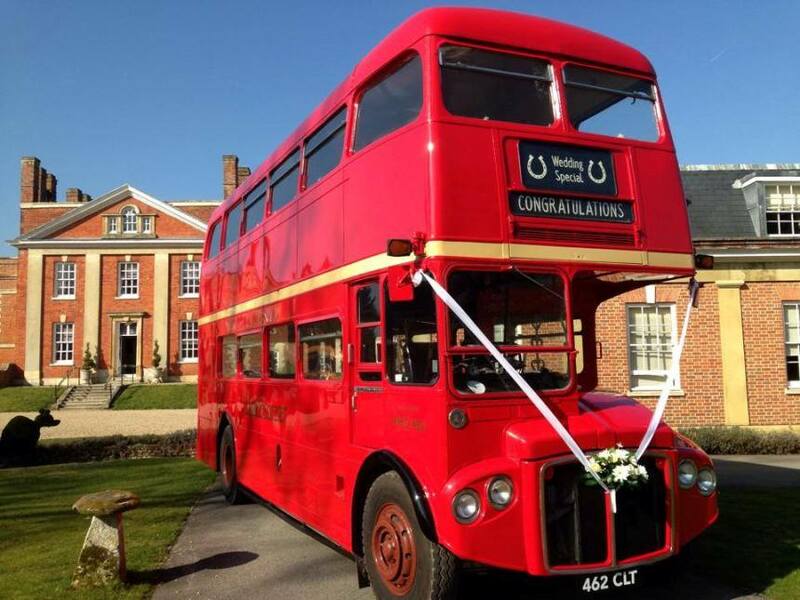 There are many old traditional barns around the UK that now open their doors so to weddings and events, these barns are full of history and often set in lovely country surroundings where you may have to consider access for tour wedding car. On the other hand there are now a wide choice of new, purpose built barns that can give the same rustic feeling of nostalgia. The advantage of the newly built barns is that access is well considered and whether you are choosing a modern or traditional vintage car or even a classic London Bus you should find that these can reach your venue. Vintage inspired weddings are very in vogue right now and have and always will be one of the most poplular of wedding themes. 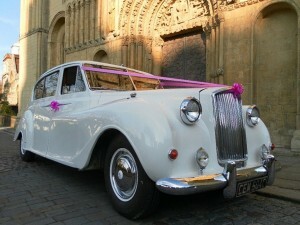 It is not just vintage wedding cars we are referring to but the whole wedding. This could mean getting married in an old Victorian manor house, using vintage paraphernalia such as invitations and decor or even going as far as hiring vintage furniture and props for the wedding. – Pick up bride and father of the bride from a house or hotel. – Take both of them to the church in the wedding car. – Drive the bride and groom to their reception venue. There are now a few variants to the above as many venues will offer ‘all in one’ weddings where you can get married and have the reception in the same place, possibly even stay there the night before. 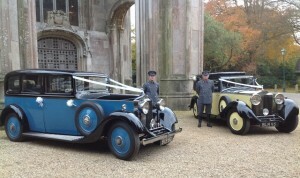 However, as long as a journey is required from collection to the wedding venue then a classic car option is still very much a traditional part of the day. As well as the theme, your colour scheme can help set the tone for the whole day and of course everything to do with the wedding should be considered in terms of its colour, this could be everything from suits, dresses, decorations and of course the wedding car. Quite often the wedding car is chosen as it can match the colour scheme but also on occasions it can be chosen because it may be a great contrast to the colour of the wedding dress to help make it stand out, this is something to think of particularly when considering photos and even can go as far as taking into account the interior of the wedding car. 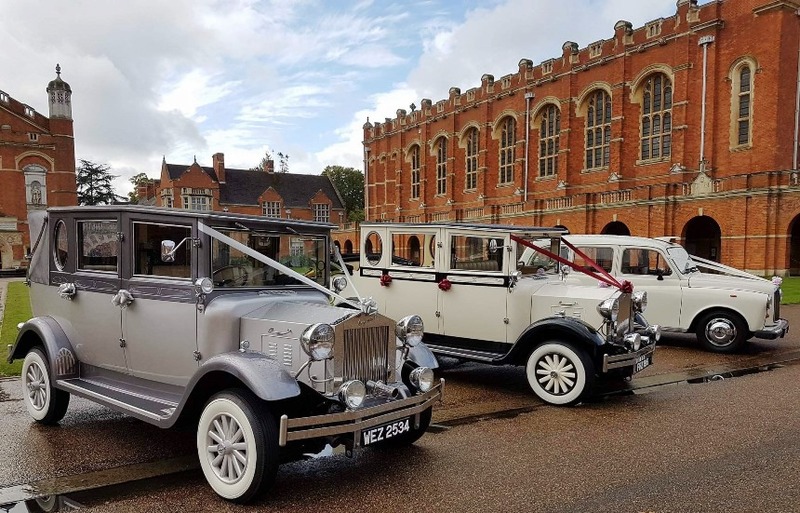 The traditional colour of a wedding car is White or a shade of White such as Ivory, Cream or the old fashioned ‘Olde English White’ synonymous with older vintage and classic cars. If however you are looking for a real authentic vintage car like a Rolls Royce then many of these from the 1920’s and 1930’s come in Red, Blue, Yellow, Green etc and so can be quite specific to a colour scheme. The interior of a wedding car is not necessarily always the first consideration but of course it is a very important factor, the last thing you want is for your car to arrive and the interior is either not up to the standards it should be, too small, or the wrong. 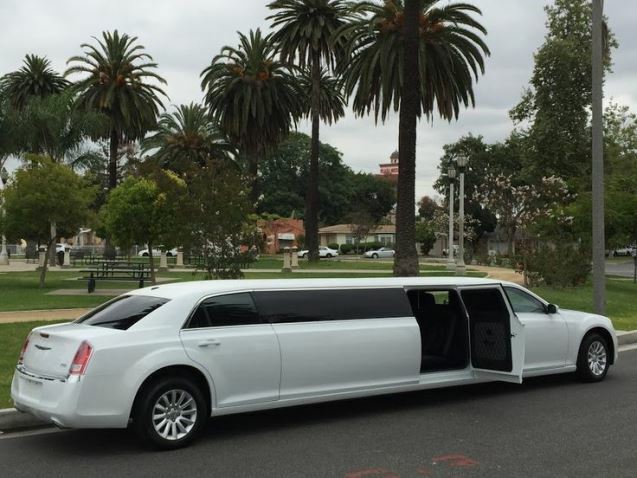 First and foremost the interior needs to be large enough to accommodate the number of passengers required and / or be spacious enough for the bride, particularly if she is wearing a large bridal dress. Comfort is of course another major factor regardless of whether you have a vintage, classic or modern car, a Campervan etc and the comfort may not just be how soft and comfortable the seats may be but also the legroom and general space. 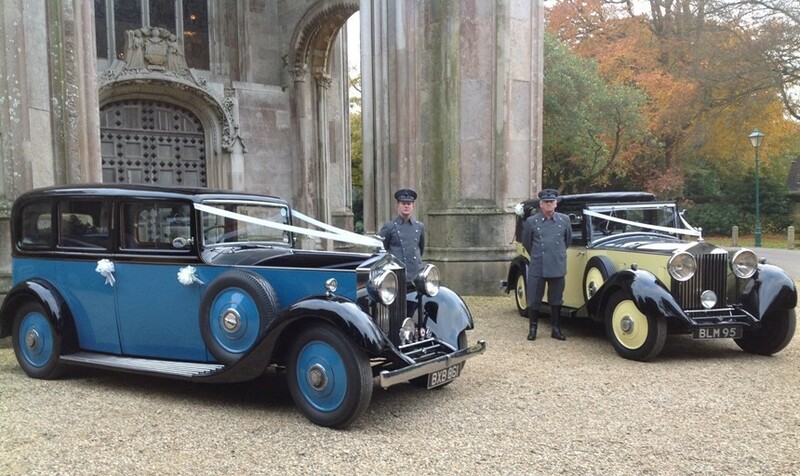 Some of the vintage and classic cars can be very large inside with seating for 5 – 6 passengers but on the other hand some of them can be very small with seating for just 2 or 3 passengers so its well worth investigating this when looking to book your wedding car. Traditionally there was always just two people at a time that would be travelling in a wedding car – bride and her Father from the home (or hotel) to the church and then bride and groom after the wedding ceremony. Times have changed though and there are a few factors now as to why wedding cars are now transporting more people. 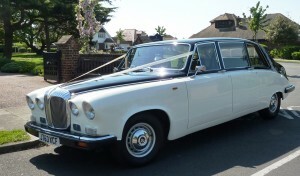 First of all, if the wedding venue and home or hotel address are close to each other then it can be possible to undertake a 2nd journey, so for example if you have hired a beautiful vintage Rolls Royce then Mother of the bride may like to experience a journey in it and also arrive at the church in a bit of style, as may the bridesmaids or other family members. On the other hand, if there are other people to cater for in terms of transporting them to and from the wedding venue then hiring a 2nd or even 3rd car is often more practical. There are some models, for example the classic Daimlers and Austin Princesses, even some of the larger vintage Rolls Royces that are capable of carrying 5, 6 or sometimes even 7 passengers which can be used for carrying the bride, her Father and other family or solely just for bridesmaids. More often than not, the bride will have the more stand out and so called more special car, after all she would not want to be overshadowed on her special day would she? !